Relationships: Are you in one? Do you desire one? Are you ending one? Are you so focused on success that you don’t have time for one? Whatever your situation is, you can probably answer yes to at least one of the above questions. As humans, we desire understanding, warmth, and compassion. Often we seek this in another. Ideally, this is a wonderful experience. Difficulties sometimes occur when we find ourselves in a relationship or looking for a relationship to fill a lack in ourselves. It is common for people to be attracted to what they lack. There is nothing wrong with this attraction. Problems arise, however, when the lack is related to self esteem. If we lack self esteem and look for it in another, we are looking for trouble. You’ve seen it…the man or woman who feels inadequate and draws to him or her a person who will make him/her feel complete. We need to first feel that completeness in ourselves, and then share it with another. This avoids the whole realm of problems which arise from “clingy” partners who never seem to live their own lives. We can either be one or be with one. Both of these situations are potentially crippling. “So, knowledgeable Steve G. Jones, what is the answer?”… You may be asking by now. The answer, like all good answers, is simple. Be yourself. Simple yet powerful advice. What I mean by this is you should accept who you are, decide where you WANT to go in life, and live an intentional life that fully embraces you and your chosen direction. Stop reading for a moment and take a look around. Go ahead…look around the room you are in. Whatever it was, you created it. You are the author of your life. You made all this happen. You are the artist. Did you like what you saw? If so, good. If not, I give you permission to change it…all of it…to re-write it from the ground up starting today. To live a life worthy of YOU and your dreams. Now, think about your present or last relationship. Is/was it something that you are proud of and happy with? Are you taking more than you give? Are you giving more than you take? Are you being a crutch for someone? Is someone being a crutch for you? These questions aren’t always easy to answer, but answering them can give you a new sense of freedom, determination, and purpose. Let’s focus on you now. I had you do that exercise so that you could get a picture of what is going on in your life. YOU are the only person you can ever change, so let’s get really focused on YOU right now. Do you need more confidence? More feelings of self- worth? A new relationship that works for you? Do you need to stop attracting to you partners which are toxic? If not, that is wonderful and I applaud you. If so, you can greatly benefit from the suggestions and guides on how to become successful in dating and relationships contained in this book. Everyday I get emails from people asking me how hypnotherapy can help them find Mr. Right or Ms. Right. I believe that there is someone out there for everybody. If you are searching for Mr. or Ms. Right, I encourage you to get out there and meet people. Of course, you won’t want to date everyone you meet and you won’t want to marry everyone you date, but it’s a start. Just go out there and meet people! Most people, when they think about meeting people, think of going to bars and clubs. But there are so many more places to go to meet people! I encourage people to go out and do the things they love doing. I believe that is the best way to meet someone who is right for you. Perhaps you like being outdoors and being active, you could meet people by joining a group that participates in a certain activity that you enjoy. Or maybe you like to cook, you could take some cooking classes and meet people that way. And always keep your eyes open, you never know who you are going to meet as you are walking down the street! 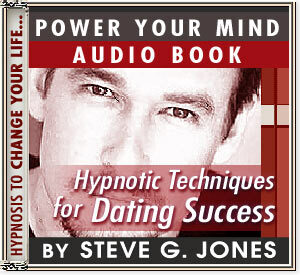 Steve G. Jones charges $1,700 for the 12-week Certified Clinical Hypnotherapist course at his hypnotherapy school, the world-famous Steve G. Jones School of Clinical Hypnotherapy, but now he shares his techniques in this conversational-style audio book. Learn the same hypnotic technique he uses with Hollywood actors, doctors, and business professionals to achieve AMAZING results!!! Hypnosis is the easiest way to affect change in your life because the positive messages go straight to your subconscious mind effortlessly so you can accomplish your goals and reach for the stars!! All you have to do is listen to the CDs or MP3 and do the fun and easy exercises. Steve G. Jones is a graduate of the University of Florida and is certified as a Clinical Hypnotherapist by the National Guild of Hypnotists and the American Board of Hypnotherapy. He has been helping people improve their lives with hypnosis for over 17 years…now it’s time for him to help YOU…don’t wait, do it NOW !!! you’ll be glad you did. See you at the top! No wonder Steve is the leader in hypnotherapy. How lucky are those who have had the benefit of his genius!